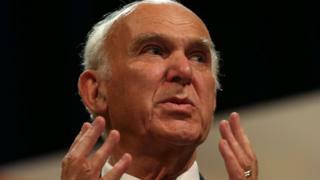 Lib Dem leader Sir Vince Cable will claim his party is a "secret phenomenon" defying opinion polls as he launches its local election campaign.He will point to "real votes in real ballot boxes" in council elections.Sir Vince will also say there are "stark differences" between the Tory-Lib Dem coalition, where he was business secretary, and Theresa May's Conservative government.Voters go to the polls across England on 3 May for local elections.Seats on about 150 councils are up for grabs, on a mixture of metropolitan, unitary, borough and district authorities. Local elections: Are they about bins or Brexit"It is occurring in by-elections all over the country, week in, week out, to local authorities from Sunderland to Somerset. "Against the Tories. Against Labour. In Leave areas. In Remain areas. "Since the general election in 2017, the Liberal Democrats are up 15 seats, double Labour's increase of 7, while the Conservatives are tanking - they have lost 18 seats. "These real votes in real ballot boxes show Liberal Democrat support at double our national opinion poll rating.Sir Vince became leader after the general election when predecessor Tim Farron said he could not reconcile his Christian faith with his responsibilities as leader of a liberal party.In his speech, the Lib Dem leader will promise extra investment in school budgets and a new homes drive, including curbs on the right to buy. "Liberal Democrats show what active local government can do at its best," he will say. "Building quality, affordable homes using the levers we have, and campaigning for more." » Local elections: Do voters care more about bins than Brexit?